Content management systems (CMS) are great if you don't want to go through the tedious process of creating, designing and developing everything from the ground up. You'd simply need to purchase web hosting, install the CMS you prefer and you'd be good to go. With that in mind, there are three that truly dominate the scene in terms of market share: WordPress, Joomla and Drupal. Different websites warrant for different needs which is why we're not going to simply declare the "best" one in this article. We are going to pit the top three CMS against each other to give you an idea of what to expect upon installation. Their publicly-known statistics, ease of use, versatility and e-commerce support are going to compared with each other. Before we go any further, it has to be taken into account that this article took a few weeks before being published, so the current numbers may have already changed. There are a lot of factors that can lead to the changes with the numbers such as a plugin being updated, an exploit being found and other things. One of the most common reasons why the number of downloads of a CMS increases is a popular theme being released for free. WordPress dominates the entire web with over 17 million websites using it. Its 52% market share is impressive compared to Joomla's 7% and Drupal's 2%. With the top websites, WordPress still dominates with a 38% market share while Drupal's 8% overtakes Joomla's 1%. Though the general stats might lean toward WordPress a lot more, it's still a close competition at the very top. Notable websites that use WordPress include CNN and Forbes. Harvard University and Linux operate their websites with Joomla. Drupal was the White House's choice for their CMS. Take a look at the most important numbers when comparing WordPress, Joomla and Drupal. One of the most important things that you have to look for when choosing a CMS is its ease of use. The primary reason why so many people go for a CMS instead of building their website from scratch is the fact that everything's already pre-built and, if its really popular, the amount of support that you can get on the web. With WordPress, Joomla and Drupal, there are already large knowledge bases on the internet where you can gather information. Lots of web hosting companies already offer instant installation of the most popular content management systems. A base installation usually goes through three processes: file upload, database setup and population of data. CMS are so popular because it takes you less time for your website to go live than to prepare a cup of coffee. Comparing the three, WordPress has the quickest installation time at just 2 minutes if you decided to go through the steps yourself. Drupal, though quicker than Joomla's 10 minutes with its own 8, looks incredibly bare bones. You need to have a good amount of control with your CMS so you can drive your website to the direction you want it to go much easier and faster. There are many factors that can affect how different the content management aspect of a CMS is perceived such as theme integration, SEO capabilities, plugin availability and, most importantly, user-friendliness. WordPress has a lot of advantages over Joomla and Drupal. Its active community, both from WordPress.org and the WordPress.com service, is always ready to help out someone who might be having trouble with their setup. This makes using WordPress as your go-to CMS a lot easier and gives you a boost in confidence knowing that you always have people to fall back on and get answers out of. Free themes are abundant for WordPress with paid themes becoming more and more affordable while maintaining their high quality. The open-source developer community loves WordPress for its ability to be as flexible as possible with the many plugins you can install on it. Compared to the other two in this list, it boasts a wide variety of plugins including ones for search engine optimization. WooCommerce is a popular e-commerce plugin which has taken a life of its own. Other e-commerce plugins for WordPress make it easy for business owners to expand their presence online. Forked from Mambo, Joomla exemplifies the leverage of a community when it comes to open-source content management software. It's not tough to see why Linux.com prefers Joomla with so many developers constantly contributing their own little piece into the project. Joomla has taken leaps with its user interface. It used to looked like a clutter and confused a lot of people in its early stages, but its modern and simplistic approach has won many people over. Community contributions are valued highly by the Joomla developers and that's a recipe for a versatile CMS. Whether it be templates, plugins, modules, components or languages, you can be sure that you'll find what you're looking for. If not, you can start with your own contribution to Joomla. 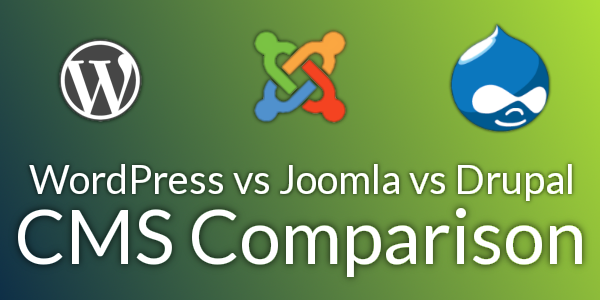 Designed for enterprise-level production websites, Joomla packs a lot more punch when you compare it to WordPress and Drupal in terms of content management. Having a bare bones CMS could either be a pro or a con for a lot of people. The amount of things that you can accomplish with your Drupal installation is almost limitless provided you know how to work with the back end. The White House has used Drupal for years and have had no major security issues so far. That's a good sign. The possibilities are endless with Drupal when it comes to development. If you are looking to still exercise your coding skills while using a powerful CMS, then Drupal is the perfect choice for you. SEO is a priority for the average Drupal setup. It could be argued that this is the reason why Drupal beats Joomla within the top 10,000 websites even though Joomla has a bigger overall market share. Scaling with Drupal is effortless. Similar to Joomla, it was developed with enterprise-grade compatibility in mind, boasting the ability to hold thousands of pages with no optimization issues. WordPress takes the crown for its versatility and with the amount of resources already available on demand. Joomla is great if you are going to run a company website with a mishmash of a lot of different forms of content. Lastly, Drupal is the perfect CMS if you're an aspiring developer, but don't want to start from the ground up. Get started with your website today and install WordPress, Joomla, Drupal or any software that you want at just one click of a button with MasayaHost. Web hosting starts at $3.95/mo and comes pre-installed with hundreds of themes for you to choose from! All of them are free to setup as long as you have web hosting so it doesn't hurt to try them all and see which one works the best for you. Already running a website? Tell us which one you're using in the comments section.